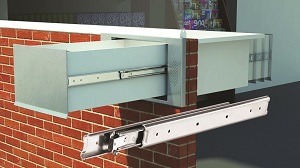 Accuride presents Model 0363, a full extension, two-way travel slide that allows drawers to be accessed from both sides of an installation. This product expands storage in medical or industrial supply carts, or works well in projects calling for interior and exterior access such as drawers or trays used at drive-through businesses such as pharmacy or bank. Offering a 100-pound load rating, Model 0363 has a detent that keeps the drawer or chassis in place at the center point of the slide travel. The slide fully extends in both directions from the center detent to give complete access to drawer contents. There is no disconnect, which ensures conveyances are not removed accidentally. This product has been tested to 80,000 cycles and is available in zinc in lengths of 16", 20", 24", and 28". It is RoHS compliant.